Covered in velvety spires, that hummingbirds desire, Mexican Bush Sage is a wonder that every garden should hold. This All Purple Version is a bold color addition and also looks great planted with the traditional variety of Salvia leucantha which has both purple and white flowers. The bush above is about 6 feet in diameter and was once a three inch pot. This plant is sometimes available in plug trays. These trays hold 128 of all the same plant. They are a great low cost way to fill a lot of space. Each cell is 3/4 of inch by an inch. 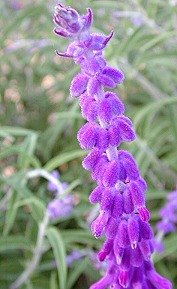 Check here to see if All Purple Mexican Bush Sage Plug Trays are available.